Apple has recently added a warning during app validation to caution users that apps for the App Store will require 64-bit support starting on February 1, 2015. This warning does not yet prevent uploading and publishing 32-bit-only apps. If you like, you can migrate your app to the Xamarin Unified API to add 64-bit support. The Unified API is available in the current stable and beta builds, but note that is still in "preview" because the API is not yet finalized. Certain types and methods are still being revised, so if you move to the Unified API now, you might need to update a few types and methods after the finalized Unified API release. The archive passed validation with several warnings. WARNING ITMS-9000: "Missing 64-bit support. Starting February 1, 2015, new iOS apps uploaded to the App Store must include 64-bit support and be built with the iOS 8 SDK, included in Xcode 6 or later. To enable 64-bit in your project, we recommend using the default Xcode build setting of “Standard architectures” to build a single binary with both 32-bit and 64-bit code." You write "If you like, you can migrate your app to the Xamarin Unified API to add 64-bit support." ... Is it really "if I like"? I understand this is absolulty necessary if I want to be able to continue publishing my apps after feb 1st! ... Is it really "if I like"? I understand this is absolulty necessary if I want to be able to continue publishing my apps after feb 1st! Please clarify. If you like, you can migrate now instead of waiting for the finalized Unified API release. The finalized release will be available before February 1, 2015. You will eventually be required to move to the Unified API (starting on February 1, 2015), but it's still optional at the moment. I was going to ask when the finalized version of the Unified API would be released? Watch for a blog post on http://blog.xamarin.com/ in the upcoming month about the timeline for the finalized Unified API release. Alpha or beta channel builds will likely be available starting in December. There is no centralized list of known bugs in the preview versions. There are certainly some rough edges (for example ) as well as some APIs that will change in the final release, but the preview versions can already be used to publish 64-bit apps on the app store. For example, https://itunes.apple.com/us/app/days-until-xmas/id578104612?mt=8 is a unified 32+ 64-bit app. Yeah, Xamarin's a little late to the party it would seem. I've migrated an app to unified API but I still get that warning from Xcode when submitting it. Is it normal? I have the same problem as xeo - upgraded my project using Tamarin Studio and fixed all errors, but the warning is still there. So far it's a show stopper and I'm going to have to stash a bunch of changes until a fix is available. 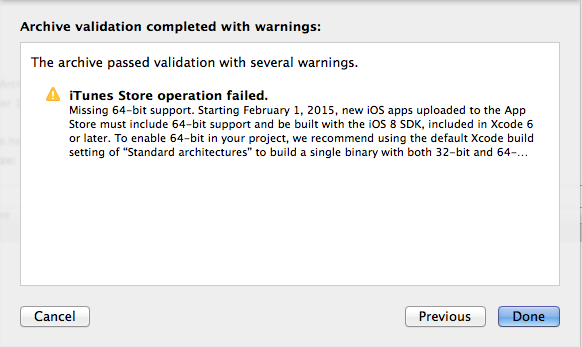 I've migrated an app to unified API but I still get that warning from Xcode when submitting it. Should I Ignore this message? as of today the warning is still there with the new Xamarin Dlls. Whats going on? Under your iOS project settings, go to iOSBuild, then click on the Advanced tab. Make sure you include ARM64 in your Supported Architectures. Thanks for pointing this out. I've updated our 32 and 64 bit Platform Considerations document to make this point clearer. @KMullins‌, no problem. Also, I'm not sure if it's just me. But ARM64 does not appear when I use Visual Studio. But it does appear when I use Xamarin Studio to build. It threw me for a loop for a while, but realized it was present only when I build with Xamarin Studio. Possible bug in the VS UI?? @rmacias‌, let me check with the Visual Studio team and see. You might also want to see if a bug has been opened for this in Bugzilla and either add to an existing one or file a new one if it hasn't. thanks to all for the quick answers. What are the meanings of the different architectures (v7, 64). Which one should we exactly choose? Or do they produce all the same code? ARMv7s is the latest architecture supported only by the A6 processor included in the iPhone 5 (or greater). ARMv7 code is faster and smaller than the ARMv6 but only works with the iPhone 3GS and later, but is required by Apple when targeting the iPad or a minimum iOS version of 5.0. ARMv6 works on all devices but is no longer supported by the compiler shipped with Xcode 4.5 and later. ARM64 is required to support iOS 8 on iPhone 6 or other 64 bit devices and will be required by Apple when submitting new or updating exiting applications in the iTunes App Store. Including multiple architectures doubles the size of the executable, but allows for newer devices to use better optimized code while still supporting older devices. I've also added this information to the documentation. I trasform my app with unified api in Xamarin Studio and changed my supported architectures to "ARMv7 + AMRv7s + ARM64". 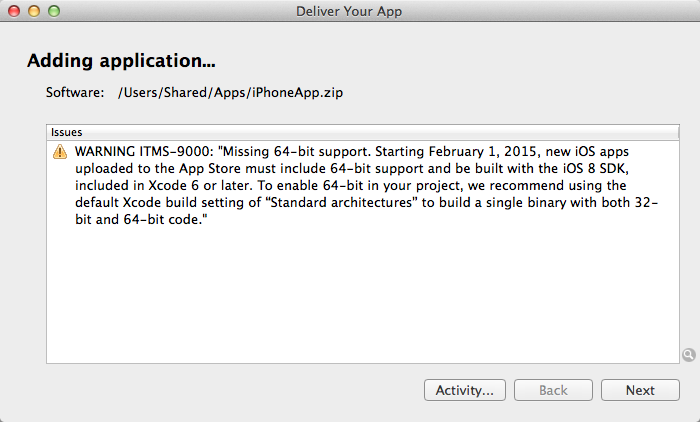 "Missing 64-bit support - Beginning on February 1, 2015 new iOS apps submitted to the App Store must include 64-bit support and be built with the iOS 8 SDK. Beginning June 1, 2015 app updates will also need to follow the same requirements. To enable 64-bit in your project, we recommend using the default Xcode build setting of “Standard architectures” to build a single binary with both 32-bit and 64-bit code." I am desperate. Someone help me? @Gianangeli1977 See https://bugzilla.xamarin.com/show_bug.cgi?id=25796. Fix is to manually add 'ARM64' under in the project file. Also, make sure that, when building and Archiving for Publishing, you target Device instead of any device you have plugged in. If the device you have connected is 32-bit, such as the iPhone 5c, the Archive for Publishing appears to archive a 32-bit version, whoops. This is what I was missing when my archive was having this strange behaviour. Good catch! Xamarin need to have look at this. What I have plugged in at the time of archiving should have no bearing on what it archives. Also note that I had to restart Xamarin to get this to reset and correctly archive both architectures.